Below is a guest blog from a dear college friend of mine. I've known for quite some time that she is passionate about Holocaust education, both speaking to students herself and also arranging to bring Holocaust survivors into schools. And I've always known that she is one tough cookie. I was shocked when a little more than a week ago she started posting on Facebook about a principal who denied a teacher's request to have a survivor speak to 8th graders, and used the Common Core as the rationale for his frighteningly bogus decision. I was not shocked that she decided to put up a fight. I immediately asked her to consider writing up her experience as a guest blog, and she graciously accepted. I want to thank her for her steadfast resolve in bringing this rich curricular experience to students. Without people like her, who have sincere passion for such a vitally important topic, I fear strict adherence to the Common Core standards will deprive our nation's public school students of experiences that make them not just good test takers, but caring, compassionate citizens. My name is Andye Daley. 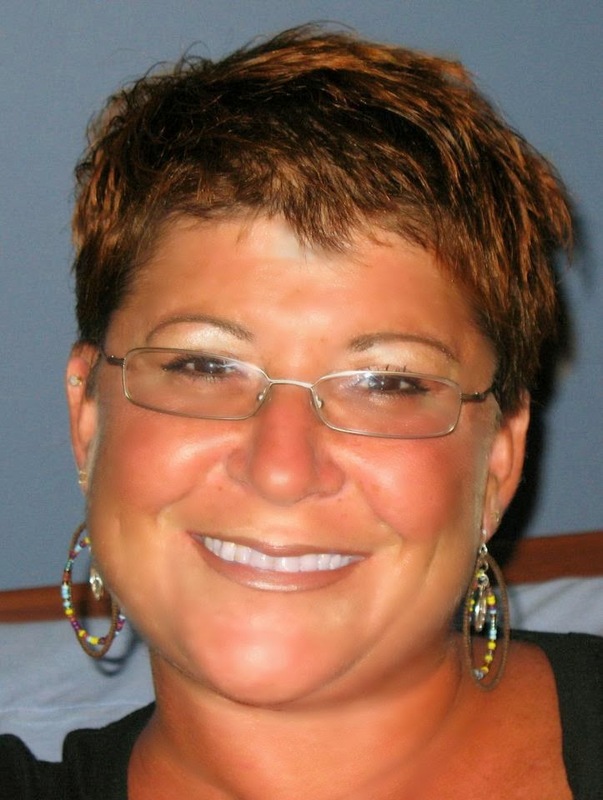 I am a mother, an educator, past vice president of The Holocaust Education Center of the Delaware Valley Board of Directors, and on the Board of Directors of Jewish Family Services of Delaware. I am also a strong believer in Holocaust Education. I feel it is vitally important as it pertains to teaching our young middle school and high school students. months. I thought perhaps the standards could be beneficial to our people, but now I have seen first hand how the implementation of the Common Core is slowly taking the humanities out of our schools. Just last week I had to push back firmly on the misguided actions of a principal. An Appoquinimink district teacher asked me to see about getting a Holocaust survivor to speak to the 8th grade student body at her school as I had done the year before. I was very excited to help. Imagine my surprise to get an email an hour later saying I should hold off on securing the speaker because she got "shot down about having a survivor to come” by her principal. The teacher pleaded and was denied. She felt it was no longer about the life lesson or experience, but rather about the Common Core. The principal went on to say that they were not there to teach about the Holocaust because ”they will get that in high school.” The teacher also wanted to show Oprah at Auschwitz, a 45-minute video, and while the principal felt there was no applicable standard associated with this activity, he ultimately approved it while still denying the speaker. There was no way I was going to let this principal’s interpretation of the Common Core Standards stop a survivor from speaking to students. My first call was to the Delaware Department of Education, where I spoke with the person in charge of ELA Curriculum, Instruction, and Professional Development for the state, and therefore oversees Common Core. She told me that each district can "interpret" Common Core and that it seems the principal took the most literal interpretation he could find. I asked what oversight the DOE had over a district's interpretation of Common Core and while she said that if she feels a district is misinterpreting the standards she could intervene, she stopped short of offering to make a call. She did say she would call me back to see what happened, but as of now I have yet to hear back from her. I rarely do this kind of thing but I have to give a shout out to my friend Andye Daley. As many of you know, my parents are Holocaust survivors. Time is passing, the years are taking their toll on the survivor community. In the not too distant future, we will no longer have eyewitnesses who can share their experiences, and in doing so, make the most important impact on educating future generations. It is so important to do this now, to engage young people in genuine conversations with those who were there. Andye is a mother, an educator, an activist and a truly passionate person. She is fighting a very good fight right now against a very ignorant, uninformed and misguided principal in her Delaware school district, who, among other things, thinks that having a guest speaker come to his school is "not common core aligned." It is literally making me nauseous, as an educator, a Jew, the child of survivors, a principal, a teacher and a lover of authentic, rich curricular experiences for students, to imagine that there is a school leader out there who interprets common core this way. There are layers and layers of issues here…but I just have to thank Andye. This daughter of a Dachau survivor is beyond moved that she is standing up for what is right. Thank you Andye for doing what needs to be done to make sure the stories are told before it is too late. Two nights later the principal contacted the teacher, fearful that I had been posting about the matter “all over Facebook.” This felt to me like the principal’s attempt to get me to back down. “Not gonna happen” I informed the teacher. The principal then requested a meeting with me. I agreed, but only if either the superintendent and/or the assistant superintendent was also in the meeting with us. I met with the principal and the asst. superintendent for about an hour and a half. I asked him to explain, in his own words, what had happened. It was apparent to me that there was a lack of judgment on his part when he told the teacher that she could show a video of Oprah interviewing Eli Wiesel at Auschwitz, yet not give her the approval to have the survivor come to speak to the entire 8th grade. He said he thought the video would suffice for "historical reference." I asked why this was his choice over an actual first hand account with a person who could hold a question and answer period on the subject. "How is a video able to answer questions that come up better than someone right in front of them?" I asked. After hearing the speaker, the students could ask questions, write an account, do research - all Common Core Standards. I then took the opportunity to bring up his interpretation of the Common Core Standards and how our administrators need to do a better job in relaying to principals and teachers that while there may be good aspects of Common Core we need to couple them with the ability to reach outside the standards to make sure the humanities are not lost. Both agreed. This also went on for some time. I am really struggling with how the Common Core can be used to squash the passion of our teachers. How it can create roadblocks that inhibit teachers from maintaining their love of teaching. How can you have students who are passionate about learning if you have teachers who are told not to be passionate about teaching? One has a direct effect on the other. As we left it, the principal was to reach out to the 8th grade team of teachers. It was my hope that I would quickly get a call telling me to go ahead and schedule a Holocaust survivor to come and speak to the 8th graders. The next day at about 1pm that call came! This is a great outcome, and I am hopeful that the principal has learned from this experience. Below is the email I sent to him, cc'd to the superintendent and asst. superintendent. “Thank you for agreeing to have the Holocaust speaker address your 8th grade. I know that the students will get so much out of this experience. I want to just go over a few details. I have given you the contact information below on who to call to set up the speaker. I have also agreed to help in the transportation of whichever speaker you get, as they are up in age and do not drive. Understand that this is quite an undertaking for these survivors and speaking more than once a day is really out of the question. Therefore, having them speak to the entire student body at your school will not happen. That is one of the reasons I initially said that she or he would only be speaking to the 8th grade. Let me know as soon as you have a confirmed date so I can free up my calendar so that I can pick up and drop off the speaker. Thank you again I look forward to helping facilitate this very beneficial event for your 8th grade students. I see the Common Core Standards as a guideline for educators, but when interpreted too literally we lose the very idea of how standards are to be used. Teaching about the Holocaust can teach our youth so much; everything from tolerance and the dangers of stereotyping, to inspiring them with the heroic actions taken by those in dire straits. If we take the humanities out of our teaching we are likely to take the humanity out of our future! A dangerous precedent if you ask me! UPDATE: In less than 48 hours this post has been shared over 100 times from my original Facebook post, and has been viewed on this blog over 4,500 times. This kind of reach may be typical for Diane Ravitch or Jersey Jazzman, but not for my little blog. Clearly, this post strikes a chord. The idea that the Common Core could be used as the rationale for denying a teacher's request to bring a Holocaust survivor into a school, is unnerving. Some have pointed out that the principal was wrong, that the Standards could and do relate to such lessons. To me, this misses the point. That the principal used the Common Core Standards, rightly or wrongly, to deny this vital experience to students, an experience that will all too soon not be possible as survivors age and their numbers dwindle, is significant. It is an extreme example of what many fear we will lose when we "standardize" what our children are expected to learn. As Andye so rightly said, we are likely to take the humanity out of our future. A dangerous precedent, indeed. Thanks to Andye's hard work and determination, Holocaust survivor Anne Jaffe will be speaking to 8th grade students in the Appoquinimink school district in Delaware. Here is a video of Anne giving a lecture to Villanova students. Anne's story must be told. It was a great honor to participate in yesterday's NJ Ed March, which brought together education advocates from all over the state, a fact the Star-Ledger failed to mention, instead choosing only to report that "(s)everal hundred Newark parents, teachers, students and community activists rallied in Trenton." The event was intended to highlight the resistance to the haphazard One Newark plan, to lend support to those pushing back against Cami Anderson and Chris Christie, and to bring the message directly to Trenton. Hundreds heeded the call on a blustery, cold, not-very-Spring-like day. The districts I personally saw represented were too numerous to list, but included both urban and suburban districts from all corners of the state, from District Factor Group A to I. The Ledger's failure to report this part of the story is, quite frankly, irresponsible. I want to tell you a story about why it was so important to me to be there to support the people of Newark as they fight back against the top-down edict that is One Newark. Back in 2012 my district was riding high after putting the brakes on a charter that seemed destined to open its doors. The charter would have decimated our small budget, but the application had the support of the USDOE in the form of a $600,000 federal grant. My community staged a massive pushback campaign, including a Town Hall style meeting and a subsequent Occupy the DOE event when NJDOE staff, including then Commissioner Cerf, refused to participate in our Town Hall. We got tons of state, local and even national press coverage, which put much needed pressure in all the right places. Without the publicity drawing attention to our plight the outcry of my community was being ignored by the NJDOE. the flyer as a momento. After it was all over and the application was denied for the final time I was still hooked. I kept blogging, I kept advocating; the immediate threat to my district may have been over but the education reform threat was still very real all across New Jersey. I felt obligated to use what I had learned to help other communities and to lend my voice to the fight. 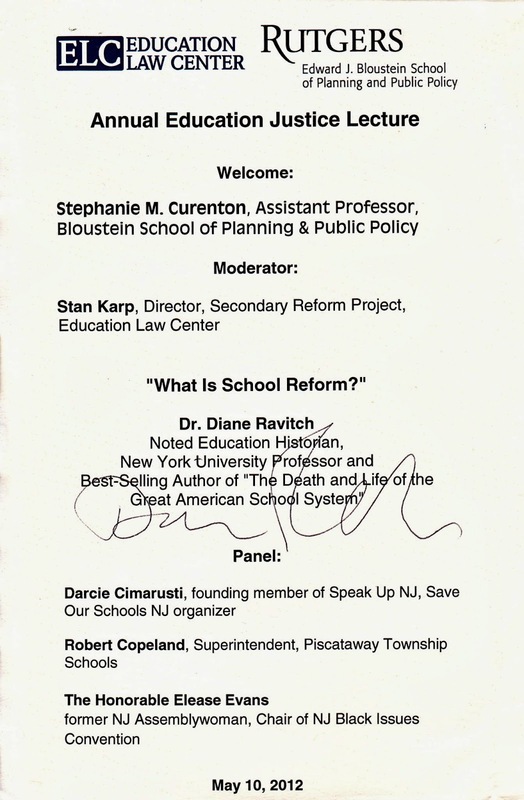 In May of 2012 I was asked to participate in an Education Law Center panel with Diane Ravitch, entitled "What is School Reform?" I was gobsmacked to be there with Diane. After her lecture came our panel, followed by questions and answers from the audience. And I'll never forget who stood up and asked a question, directed at me. It was Antoinette Baskerville-Richardson, the now President of the Newark School Advisory Board. Her question was polite but firm. I don't remember her exact words, but the gist of her question has stuck with me for the last two years. Antoinette congratulated me on how successful my community and other communities like mine had been in pushing back against reforms like charter schools, and on all the media coverage we had gotten, but she wanted to know why Newark wasn't getting the same kind of coverage for the travesty unfolding in that city. I honestly have no idea what I said. What could I say, really? She was totally right, and her question so perfectly highlighted the inequities embedded in this state. Wealthier suburbs with access to the media and the legislature able to effect change, and poorer urban districts experimented on and all but voiceless. Finally the state and national spotlight is squarely on Newark, and it's not looking good for beleaguered state appointed Superintendent Cami Anderson and her One Newark Plan. Listen to the speeches Antoinette and mayoral hopeful Ras Baraka delivered yesterday. They were filled with passion for and commitment to the public schools in Newark, the students and parents who rely on them, and the teachers and staff who work in them. Cami Anderson, State District Superintendent, must go. Not only because she disrespects us, but because we have something valuable to say. You can not hate me and love my child. That is impossible. And we must have local control now. Not in a couple of years when there are only 10 or 15 schools left, we must have it now. Because Superintendent Cami Anderson refuses to come to school board meetings, refuses to let her senior staff come to school board meetings, is planning to dismiss one-third of the teachers in Newark, is planning to close or alter one-third of the schools in Newark, and we say no. (Ras Baraka) Whose schools? (Crowd) Our schools! That's right, not the governor's, not Cami Anderson's, but the families and the people of Newark. We have a right to govern our own lives. We have the right to govern our own school system. We have a right to determine what our kids learn and what they don't. We have a right to determine who's in our kids schools and who's not. We have a right to keep our school buildings open. They belong to the people and not the corporations. They belong to the people and not the governor. In fact, the governor should belong to the people. They don't have a right to come in our city and tell us what to do. They don't have a right to come in our city and tell us they're going to close our neighborhood schools and then tell you it's reform. Reform today means close your schools. Fire your teachers. Lay off cafeteria workers. Get rid of custodians. Lay off attendance officers. Get rid of truancy officers. Fire guidance counselors. That doesn't sound like reform to me, that sounds like dismantling of public schools. That's what is sounds like to me too, Ras and it breaks my heart for the people of Newark. And in case you think Ras is exaggerating the threat to the Newark public schools for effect, allow me to remind you of the words of former NJDOE Deputy Commissioner Andy Smarick. What happens when Smarick's dreams come true? What say you parents of New Jersey? Do you want the state and this governor to have "complete control" over your schools? How much "market share" are you willing to give up to privately managed, publicly funded charters in your district? 17%? 50%? 100%? Really think about your answer. Are you willing to give up "complete control" over the governance of the schools in your district? If you are not willing to hand the schools and children in your community over to the state and charter operators that demonstrate time and time again that they are not truly public schools, why would you sit back and let it happen in Newark? Because as Antoinette so rightly points out, today One Newark, tomorrow One Princeton. And Anderson has yet to return. Natasha, I, and many others across this state, want the same for your brown babies that we want for all babies, brown or white, and I was proud to come to Trenton to help you fight for just that. We all stand together, and now that districts across the state are united and speaking with one voice on Newark's behalf, Christie and Anderson don't stand a chance. Would Pete Seeger Perform At An Eva Moskowitz Rally? I seriously can't believe I just had to write that title. Please, don't blame me, blame Laura Waters. In her latest opinion piece for NJ Spotlight she posits that Newark mayoral candidate Ras Baraka may activate the reformy base in New Jersey as she claims Mayor Bill de Blasio has in New York City. She cites the recent Eva Moskowitz rally as proof positive that de Blasio has "unified and energized" the school choice movement. We've all seen Waters engage in this type of inane rhetoric before, most notably when she invoked the late Albert Shanker and claimed he'd be a supporter of New Jersey's school choice movement. I guess Waters didn't learn not to just make sh*% up about iconic figures, even after she was called out by Albert Shanker's daughter Jennie, who informed her in no uncertain terms that her assessment of Shanker's position was preposterous. Now, I don't expect any of Pete Seeger's relatives to come out of the woodwork and clarify Seeger's politics, and quite frankly it's not really even necessary. It is simply ridiculous for Waters to posit that Seeger would have "sided" with Eva Moskowitz. Seeger has been called a Troubadour for Truth and Justice, and in this Democracy Now piece we learn about when it was Seeger first sang "We Shall Overcome." Is Waters really implying that, if alive, Seeger would be "writing ballads for Eva Moskowitz" to help her organize the school choice movement like he helped King in the civil-rights movement? Does she really think he would sing "We Shall Overcome" along side Moskowitz as he did Martin Luther King? Is she therefore implying, that school choice is the civil rights movement of our time? I'm in very good company in thinking that this is utter claptrap. As a child that was born and raised in the Bronx, I have seen first-hand the inequity of public education for a community of color. We need to make sure every child gets a quality education, not just a few. Real civil rights issues were about the fundamental notion that separate is unequal -- separate bathrooms for blacks, riding the back of the bus, being denied the right to vote, the right to hold good jobs and take part in everyday life as equals. Moskowitz is attempting to perpetuate a separate but unequal system that disadvantages children in traditional public schools and those with special education needs. That is the civil rights issue. With the heightened attention on Eva Moskowitz and her Success Academy charters some interesting things have come to light. Primarily that Moskowitz's rally and expensive ad campaign are being bankrolled by a group called Families for Excellent Schools. ... Late last month, days before the education department announced it would keep a few new charter schools from opening, supporters registered the domain name charterswork.org. At the same time, local television stations started airing slickly-produced ads. Behind the multimillion dollar ad campaign and website is the same group—a nonprofit called Families for Excellent Schools. If their message wasn’t clear, they also helped organize Tuesday’s rally in Albany where thousands of charter school advocates turned out. Who are Familes for Excellent Schools? Families for Excellent School’s most recent tax filings are from 2012, so it’s unclear how much they’ve raised in recent years or where that money is coming from. The organization is technically two entities—a standard charity and a tax exempt group that can accept anonymous contributions for advocacy. Families for Excellent Schools shares an address with the New York arm of StudentsFirst, a national education reform nonprofit led by Michelle Rhee, the former Washington D.C. schools chancellor. The Walton Family Foundation, of Walmart fame, has given more than $700,000 over the past two years. That foundation recently hired a deputy schools chancellor from the administration of former Mayor Michael Bloomberg. Another Bloomberg official—the mayor's former spokesman, Stu Loeser—is handling press for Families for Excellent Schools. A spokesman for Bloomberg says he hasn’t donated to Families for Excellent Schools. As if this isn't all the evidence anyone needs that Moskowitz's attack on de Blasio is astroturfing at it's finest, Success Academy teachers are starting to speak up about the tactics used to get so many bodies at the rally. So it's not just Waters hijacking civil rights icons, language and messaging to advance the school choice movement - this seems to be pervasive among reformers. Moskowitz is using the money and power behind her charter chain to manipulate her staff and parents into being unwilling and/or unwitting pawns in her quest for omnipotence in New York City's charter realm. Kind of hard to see this as the kind of thing Pete Seeger would have gotten behind. But I will concede that Waters may be partially right about one thing. Maybe, just maybe, Seeger would have performed at Moskowitz's rally, because he seemed genuinely eager to play for all people, no matter their political beliefs. I have been singing folksongs of America and other lands to people everywhere. I am proud that I never refused to sing to any group of people because I might disagree with some of the ideas of some of the people listening to me. I have sung for rich and poor, for Americans of every possible political and religious opinion and persuasion, of every race, color, and creed. But to claim he would "be writing ballads about Moskowitz" seems disingenuous at best, especially when you consider the big money and pressure tactics Moskowitz employs to get what she wants. My new friend and fellow education blogger Russ Walsh wrote an eloquent piece after Pete Seeger's passing, titled What Would Pete Do? Pete Seeger was the quintessential American optimist. He was the Johnny Appleseed of folksong. He was a believer in the power of good people to do good work together and to overcome oppression. I can think of no better role model for us all as we work to stop the corporate takeover of public education. Call me biased, but I think Russ has a better read on Pete Seeger's legacy. And I think Waters should stop speaking for men like Shanker and Seeger after they're no longer here to speak for themselves. If you were thinking I exaggerated HoLa and Barbara Martinez's political and media connections in my last blog post, then check out this piece, where Hoboken Board president Leon Gold eloquently unleashes his frustrations to Salon reporter, Josh Eidelson. Gold confirms just about everything in my post, and adds even more fuel to the fire. And the fact is, they are being a bit disingenuous when you read about their school board president … she is a paid activist for charter organizations. I feel that the school would not be as attractive [to others] if they did more recruiting from the Housing Authority [residents, as she pledged to do]. But the HoLa parents are so organized — and they represent, again, the richest and the brightest of Hoboken — that they talked her into writing a letter in support of HoLa. Eleven officials … backed the HoLa expansion. And it was a really interesting combination of people who really don’t like each other … [They] showed a complete disregard for public education in Hoboken. Gold is spot-on, and I salute him for his courage. His words should be a wake up call for board members nationwide, too afraid to speak out on behalf of the children in their district schools. The reckless disregard this administration, and other administrations around the country (I'm looking at you Cuomo) has shown for the health of our public schools is unprecedented. Josh Eidelson did what we bloggers often can't do - he asked the Christie administration to respond to Gold. NJDOE Spokesman Michael Yaple's response is nothing less than shocking, and shows the impact a media savvy type like Martinez has on this DOE. An insightful piece? By the Star-Ledger editorial board? Is he KIDDING ME? Read my friend Jersey Jazzman for his full analysis of that "insightful piece", which he aptly titled "No One Does Charter School Stupid Like the Star-Ledger." You can be sure I will be following up via an Open Public Records Act (OPRA) request to get a copy of Martinez's letter. I don't want to miss the details of "the school's aggressive outreach efforts" that somehow haven't really impacted the demographics of the charter in the four years it's been in operation. It's inconceivable that this is the explanation the NJDOE provided. As if the letter from Martinez and the Star-Ledger editorial were two separate pieces of evidence that informed the decision to approve the expansion. It could not be more clear that Martinez, a former Wall Street Journal education reporter and communications guru for Uncommon Schools, merely used the Star-Ledger editorial board as her bullhorn. I mean, I get it - the DOE can't come out and say "We approved this expansion because the founders and parents are really well connected, and there was too much media coverage and political pressure for us to say no," but shouldn't they at least cite some stellar DOE analysis on the segregative effect the charter expansion may or may not have on the district. This is some of the most glaring evidence I've seen that this Department of Education, under Governor Christie, is driven by ideology, relying predominantly on voices within their own echo chamber, no matter how conflicted or uniformed those voices may be. Moran, Martinez and Yaple, oh my! It's simply stunning that Yaple cited Martinez and the SL Editorial Board when asked to respond to Gold's arguments, and mentioned nothing about the DOE's own findings based on their review of the charter in the renewal process. Did the DOE not conduct their own analysis of the demographics of Hoboken charters vs. the actual public schools? Did they not at least consider the amazing work of Mark Webber (AKA Jersey Jazzman) who has looked at actual data, unlike Martinez, who, ya know, says she's knocked on "some doors in public housing." That may be good enough for the Star-Ledger Editorial Board and the NJDOE, but it's not good enough for the children in Hoboken whose schools are being gutted. My good blogging buddy Jersey Jazzman has been trying to make sense of outgoing Commissioner Cerf's decision to deny expansion to a suburban Hebrew language immersion charter (Hatikvah) when he approved the expansion of an urban dual language charter (HoLa) that, at least on the surface, seem very similar. His reference to the Port Authority may sound flippant, but it really isn't. What Did Cerf's DOE Consider? I've read both Hatikvah's denial letter and HoLa's approval letter, and Chief Innovation Officer Evo Popoff was very clear; the state's decisions were based in large part on 'student performance on state assessments" mostly taken straight from the NJ School Performance Reports. If you look at the state's data, and believe it paints a complete picture and merits use in high-stakes decisions, (which I don't) such as whether or not a charter should be allowed to expand, then HOLA is doing far better with their students than Hatikvah. According to the reports, HoLa is performing in the 77th percentile statewide, and in the 99th percentile compared to their "peer schools" while Hatikvah is in the 58th percentile statewide and in only the 20th percentile compared to their peer schools. This must have come as quite the shock to Hatikvah, which just last year ranked in the 99th percentile compared to their peer schools, a fact which they trumpeted in their promotional materials when they were trying to increase enrollment after the school year had already started and they weren't fully enrolled. According to the DOE, the drop in Hatikvah's standardized test scores academic performance was, at least on paper, their ultimate undoing. A letter on Wednesday from Department of Education Chief Innovation Officer Evo Popoff renewed the elementary school’s charter for five years but denied a middle-school expansion into eighth grade over the next three years. Popoff cited “a decline in the school’s academic performance in the 2012-13 school year." Both letters also claim the state reviewed "public correspondence and comment." My bet is the correspondence had far more impact on the final decision than the academic performance. Especially when you take a close look at the players involved, particularly in Hoboken. Consider this, posted on the HoLa Facebook page after they received the "GREAT NEWS!" Wow! That's a pretty juicy list. UNION CITY — Gov. Chris Christie picked up another endorsement from a powerful Democrat today. State Sen. Brian Stack, the mayor of Union City and a Democratic powerbroker in Hudson County, said this afternoon that the Republican governor has been one the most responsive and impressive state leaders he’s ever worked with. ...what has emerged among Democrats in New Jersey is a feeling that those who played ball with the governor enjoy favored status, while others have been shut out or had access curtailed. That is not an entirely unusual dynamic in politics, but it is one that conflicts with Christie’s carefully groomed image as a leader driven only by what is right, not petty politics. Also note that both of the Assembly candidates that ran with Stack crossed party lines to endorse Christie too, and they both supported HoLa's expansion. Something else you should know about Dawn Zimmer is that her kids attend one of Hoboken's other illustrious charter schools, Elysian. On Thursday night, Mayor Dawn Zimmer, whose allies on the board normally side with Toback, released a statement saying the charter schools and other public schools should not be in competition and should work together. Zimmer has two children in another of the city’s three charter schools. So it would seem that Christie and his DOE had some serious political pressure on them to approve HoLa. How could the Christie administration go against the Hudson County "Democratic powerbroker" and his running mates given their endorsement, or risk even the appearance that further retribution was being exacted on Zimmer by denying HoLa? 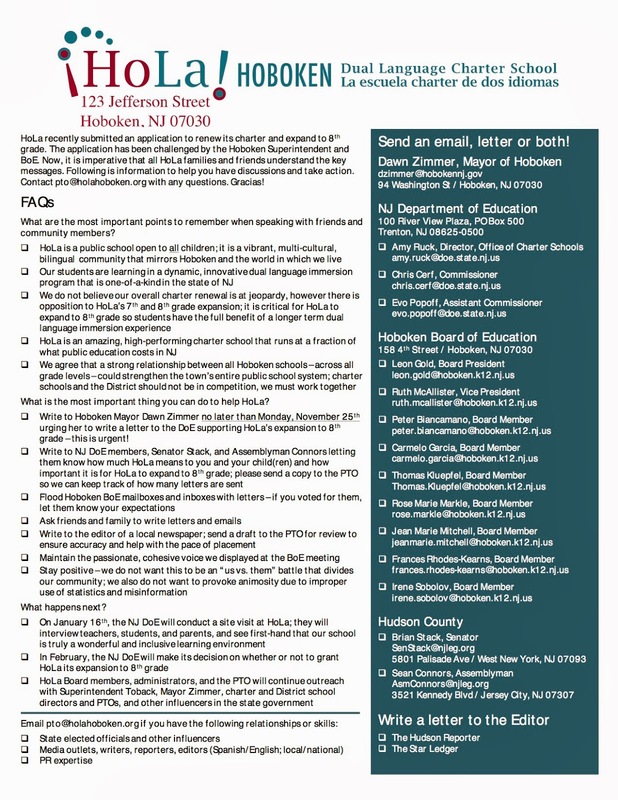 In addition, HoLa parents conducted an organized campaign to rally support for their proposal, and camped out at a Hoboken BOE meeting when they caught wind that Hoboken Superintendent Mark Toback planned to send a letter of opposition to Commissioner Cerf. They provided hours worth of public commentary and threatened to leave town if the application was not approved. Toback said that he removed the letter from Tuesday’s agenda after receiving phone calls and emails from concerned HoLa parents throughout the day. He said he is hoping confrontation can be avoided and replaced with productive conversation. Still, parents spoke for almost four hours at the meeting in support of HoLa. Parents defended the uniqueness of the school’s Spanish immersion program and its success over the past five years (which has been debated by Toback), and many parents said that while the Board of Education might want to fight its expansion in order to drive up enrollment in the public schools, they would be leaving town if HoLa doesn’t go to eighth grade. It's been well documented that the charters in Hoboken cater to a strikingly different population than the public schools, with the charters mostly white and affluent and the publics mostly minority and poor. The numbers are striking. Only 11 percent of Hola students are poor enough to qualify for free or reduced-price lunches, compared with 72 percent in the city’s traditional public schools, according to state data. Given that poverty remains the most reliable predictor of student performance, Hola has a big head start over district schools. But Toback’s response to that is dead wrong. The answer is not to slam the brakes on a successful school. The answer is to lure more poor students to Hola, something Hola is eager to do. “I myself have knocked on doors in public housing asking people if they want information on charters,” says Barbara Martinez, one of the founders. Does this statement sit poorly with anyone other than me? Are we supposed to be impressed that Barbara Martinez, one of the founders of the charter, has knocked on doors in "public housing?" I guess Tom Moran just didn't think to actually research what kind of "official" community outreach HoLa has conducted since they opened in 2010, and instead just bought her convenient line that she's working really hard, ya know, personally, to increase the enrollment of the city's free/reduced lunch kids. If he had done his homework, he may have found that way back in 2009, before HoLa was approved, Martinez was very vocal, and even back then she was spinning tales about reaching out to the minority community in Hoboken. “I’ve taken the past two days off of work (I’m a reporter at the WSJ) because the Hola program is so important to my family. Today I spent a lot of time outside Conners and Wallace – getting signatures of people who would be thrilled to send their kids to a dual-language immersion program. I met many Hispanic and African-American moms this morning whose faces lit up when I told them their children could be fully literate in two languages by the time they are in third grade. Many are planning to attend our information session this Sunday at Jubilee Center. BUT I AM SO VERY CONCERNED THAT YOU ARE DECIDING TO TABLE THIS PROGRAM FOR THE TIME BEING. The private school my daughter attends needs to know in early February whether she will be returning in September 2009 for first grade. What am I supposed to tell them? By the way, they want me to give them $1,000 if I want them to hold her spot. Several weeks after that, I have to commit to a full-year’s tuition. What am I supposed to do? Sorry to sound so dramatic – but this is really something that will affect my daughter’s future. Martinez has been talking about her desire to get "Hispanic and African-American moms" interested in HoLa since 2009. Wonder why the demographics are so still so skewed, since Martinez has spent the better part of five years personally trying to increase diversity! Don't miss the part in that last quote about Martinez being a Wall Street Journal reporter. It's important to point out that she's not just a founder of the school, she's currently the Board President, and she's also the "Chief External Officer" for the Charter Management Organization (CMO) Uncommon Schools. Barbara Martinez is the Uncommon Schools Chief External Officer. Until August, 2011, she was an editor and reporter at The Wall Street Journal, covering various topics, including public schools. She is a founder and a trustee of the Hoboken Dual Language Charter School, a K-5 school in Hoboken, N.J. Born in Newark, N.J., she graduated from New York University in 1992 with a BA in Journalism. What's a Chief External Officer? Basically, it's a very reformy name for a Director of Communications. Uncommon Schools gets a charter in Camden? There's Martinez! Uncommon Schools applies for a Renaissance School in Camden? There's Martinez! Uncommon Schools wins the Broad Prize? Martinez is on the press release! So needless to say, Martinez knows her way around education, she knows how to handle the press, and she knows how to pitch a story. And Tom Moran fell for her little spiel about "HoLa's eagerness" to "lure more poor students" hook, line and sinker. It's hard not to notice that the NJDOE has been building a very cozy relationship with Uncommon Schools, and that it couldn't have hurt HoLa's chances of approval to have yet one more connection with Christie's NJDOE. Christie endorsing state democratic leaders, local democratic leaders almost unanimously in favor of HoLa, but all charters in Hoboken, and an influential and well connected Board President with ties to one of the state's favorite CMOs and easy access to the state's largest newspaper, all too eager to explain away the glaring segregation happening in Hoboken. Viewed through this lens, HoLa's approval was a practically a foregone conclusion. Geez, I'm almost feeling bad for Hatikvah! Seems like the support of a hedge fund demi billionaire just isn't enough anymore! 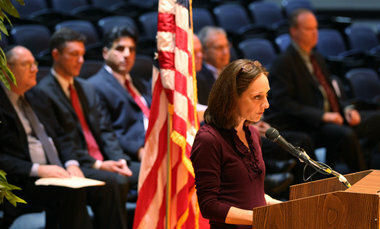 (East Brunswick) – Senator Peter Barnes, Assemblyman Patrick Diegnan and Assemblywoman Nancy Pinkin applauded the Department of Education’s decision to deny the application for expansion by Hatikvah International Academy Charter School to include a middle school while allowing the elementary school to remain. The legislators stressed that this is an example of the potential divisiveness of imposing Charter Schools on a community without public input and support. It is time to put into law a process to require community approval as a part of the charter school approval process. Charter regulations clearly state that annually “the Commissioner shall assess the student composition of a charter school and the segregative effect that the loss of the students may have on its district of residence” and that the “annual assessments of student composition of the charter school” will be factored into the renewal of a charter. We respectfully submit that the demographic disparities between our districts and Hatikvah be given significant consideration in your decision. We are in absolute agreement that the approval of the Hatikvah expansion would be contrary to N.J.S.A. 18A:36A-­‐16(e)(3), as it would have an overall negative impact on the students, staff, parents, educational programs and finances of our districts. Hatikvah was opposed by the community, and an opposition petition garnered over 1,200 signatures. Commissioner Cerf is the sole decider of whether Hatikvah may expand, forcing our local public schools to turnover additional needed resources to Hatikvah, likely requiring the loss of additional programs and/or staff. Hatikvah cannot be allowed to continue their statewide expansion, to continue to segregate our communities and to continue to usurp scarce district resources. When viewed from the perspective of what is best for the majority of public school students, there is no justification for this charter school to expand. Please sign the petition insisting that Commissioner Cerf consider the facts and deny Hatikvah’s request for expansion. 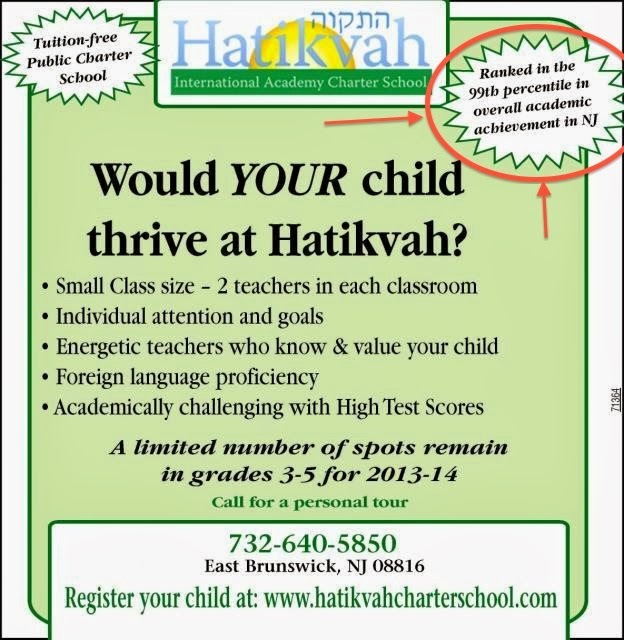 You have to wonder, were the test scores really the driving factor, or was it that outside of those families that attend Hatikvah, there is truly very little support for this or any charter in East Brunswick and the surrounding communities. Afterall, these are communities that value their traditional public schools and have no interest in diverting funds to create a segregatory, dual system. As Jersey Jazzman pointed out, both Hatikvah and HoLa seem to be segregating students and causing their districts financial distress, but other than the language immersion/dual language focus, this is where the similarities seem to end. In Hoboken, the state and local power structure (outside of the district schools) is aligned with the charters, and they have decided that a dual system where charters serve a majority white, affluent population and traditional public schools serve a poor, minority population is just fine. Many local officials, like Mayor Zimmer, avail themselves of the charters for their own children. The charters are what keep folks from fleeing Hoboken for the suburbs, so they must be a good thing, right? In East Brunswick, and the surrounding districts that have been drawn into Hatikvah, the state and local power structures (including the district schools) are struggling to maintain a single system that serves all kids, and serves them well. HoLa and Hatikvah are kind of bizzaro world charters, if you will. Seemingly similar on the surface, but existing in completely different realms. I'm proud to be in one of the districts where we are fighting to maintain a single system and strive to serve all kids. And I stand with the traditional schools of Hoboken that work hard every day to provide the same for their students.